At first pass, some people stateside might be skeptical about Nottingham-born singer-songwriter Jake Bugg who catapulted to the top of the U.K. charts last October before his debut album was released in the United States in April. But dig a little deeper into the 19-year-old singer's back story and it all makes sense. His parents both made recordings in their youth before moving into medicine and sales. His uncle taught him the guitar at age 12. And his personal taste in music was so heavily influenced by a collection of formative songwriters like the Beatles, Johnny Cash, and Jimi Hendrix that he dropped out of a music technology course at 16. Bugg said it for all the right reasons too. Any folk rock artist with an affinity for music tends to be compared to Dylan because reviewers can't seem to avoid comparisons. But give the young artist some time and it won't be long before people are comparing other artists to him as he managed to break though as an antidote to processed pop. He never expected any of it. Mostly, Bugg set his sights short and hoped to help more people re-spark their interest in guitar-driven music. Americans might even be ready for his sensible guitar rock too. Although armed with more bluegrass than beatnik stylings, Bugg does better than nostalgia with his lyrics. Most of them are well-crafted analogies and metaphors that cut at some of the conversations his generation and others are having today. Lighting Bolt only sets the tone. There aren't any answers. Trouble Town is especially poignant. Backed with little more than a clean guitar to provide a foundation, Bugg taps the tentative and tenuous grind that gets people by for awhile but eventually breaks down. There has to be something more than being stuck like that. "There's a tower block overhead. All you've got's your benefits. And you're barely scraping by," he sings. "In this trouble town, troubles are found." Not every track on the self-titled Jake Bugg debut is wise beyond his years of observations. Some of them, like Two Fingers, are confessional as the song tells a little bit about Bugg's own story, growing up in a broken home after his parents divorced. Relatively few tracks besides Simple As This or Seen It All really kick up a notch. Bugg seems to be storytelling and contemplative over faster-paced arrangements. It's in this down tempo space that he feels best suited to make a lasting connection with lyrics you want to really hear. While there are a few songs on the back half of the album that might have benefited from more diversity, few if any are throwaways. Someone Told Me, Ballad Of Mr. Jones, and the short and sweet crackling track Fire all work on the subconscious, drawing you in for a listen. The only people who might not appreciate it will probably have an aversion to twangy guitars and a short attention span for lyrics. Jake Bugg's Self-Titled Debut Snaps 9.1 On The Liquid Hip Richter Scale. Although there is some risk that Bugg could get caught up in a whirlwind celebrity status, there is no risk of losing any rawness off the debut. As mentioned, there are some songs on the album that are pretty average given the company of the brilliant tracks they keep, and there is as much timelessness as there is restlessness in Bugg's take on urban folk rock. 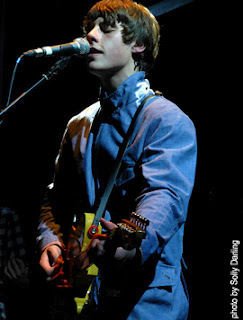 You can find Jake Bugg's self-titled debut on Amazon. The album is also available on CD from Barnes & Noble, which will warm it all up considerably. Or you can download the album off iTunes. Given his album broke in the United Kingdom back in October, Bugg already has a considerable following on Facebook.